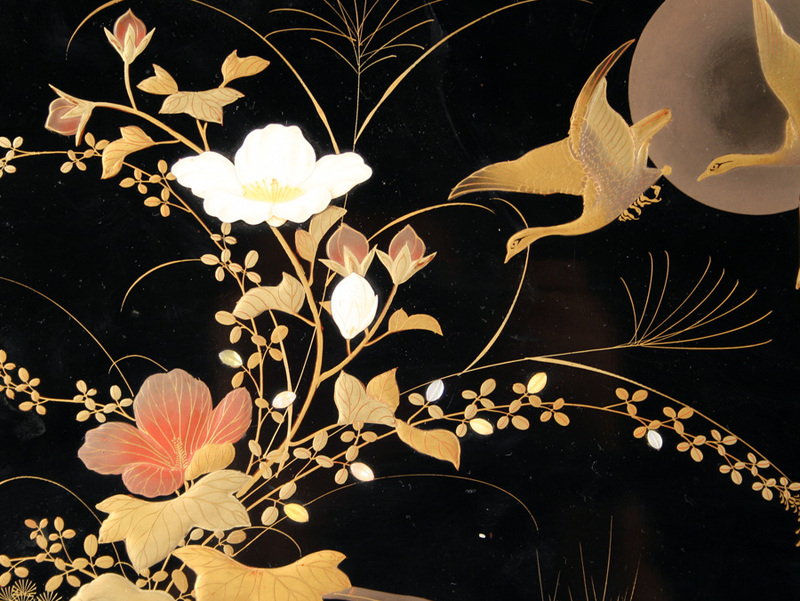 H: 10.75", W: 14", D: 2.25".Exterior relief design of geese and flora with stream on front; Ivory and mother-of-pearl inlay; back decorated with insects and plants in gold leather spine; hand tinted photographs of places, mainly in Osaka and Kobe, Japan. Inside inscription reads: "Presented to N.W. Utley and Wife by Rev. C.B. 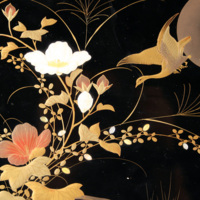 Moseley; Aug 9, 1890, Kobe, Japan"
“Photo Album of Osaka and Kobe with Gold Lacquer -detail Decorated Cover (cover detail),” ASIANetwork IDEAS Project, accessed April 24, 2019, http://ideasproject.org/items/show/869.